Demographic challenges aside, research in recent years has clearly demonstrated that diversity has a direct impact on the bottom line. McKinsey & Company reviewed 366 public companies across an array of industries in Canada, Latin America, the United Kingdom, and the United States and found that companies in the top 25 percent for racial and ethnic diversity are 35 percent more likely to yield financial results above their national industry medians. Also, companies in the top 25 percent for gender diversity are 15 percent more likely to yield financial results above their national industry medians. These statistics are not new revelations. As an executive search professional, I often hear from leaders who agree that enhancing diversity is a top priority. So why aren’t we seeing more diverse organizations? “Groupthink” is a common phenomenon in hiring processes. A well-known study by Soloman Ashe highlighted the tendency for people to be swayed by the opinions of others when participants were asked to rate the length of a line compared to a sample of three other lines. Although the difference in sizes was clear, if participants were told their peers had chosen the incorrect answer, over 75 percent also chose the incorrect answer at least once out of 12 trials. If you have ever been a part of a hiring panel, you have seen the impact the majority opinion can have on others. Panelists may go along with the group because it is easier or because the group response causes them to question the validity of their own opinion. This is particularly true when organizational leaders sit amongst the majority. This phenomenon can lead groups to overplay the strengths of the candidate the majority favours, and underplay the strengths of other candidates. Do you ever find yourself immediately drawn to a candidate because they work at a company, or with an individual, you think highly of? The Halo Effect occurs when we see one positive aspect about a person and we let the halo “glow” of this association affect our perspectives of everything else about that person. Reactions like “he worked for her, so he must be good” or “that company did big things that year, so she must be talented” inadvertently give credit where it may not be due. 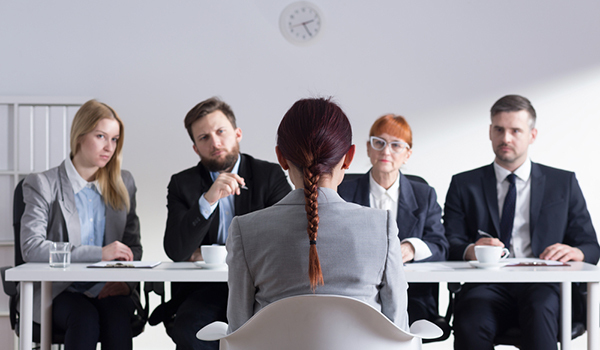 As a result, the candidate with the positive association will have an immediate advantage in the hiring process over those outside a hiring manager’s known networks. Research has shown that people who are rated more physically attractive are immediately perceived to be happier and more successful. The tendency to correlate attractiveness with the likelihood of individual success can have a direct impact in hiring decisions. Have you ever heard someone suggest a tall, athletic looking CEO really “looks that part”? In Malcolm Gladwell’s book Blink, he reveals that 58 percent of the CEOs of Fortune 500 companies are over 6 feet tall despite the fact that only 14.5 percent of the population of US men are over 6 feet tall. Not surprisingly, studies suggest men’s attractiveness ratings increase with height. Further to this point, what we believe to be attractive is influenced by our individual sociocultural backgrounds. So, if we return to the example of height, while unconscious biases may favour tall male leaders, statistics suggest that North Americans are on average taller than individuals from many other countries which may further disadvantage underrepresented groups. The affinity bias occurs when we are drawn to someone we have something in common with (i.e. you attended the same university, you grew up in the same community, or you have a mutual connection). In Atlantic Canada, we might call this the “who’s your father” bias. In a small community where it is easy to draw connections through family, friends, or professional relationships, this can easily feel like a great way to build rapport with a candidate. We have a natural tendency to want to be around people we can relate to. However, decision makers may unknowingly disadvantage candidates without connections in our region by applying this bias. Hiring managers may choose the candidate with whom they found a strong affinity, because they walked away from the interview feeling positively about the encounter, without truly evaluating if the candidate brought the best skills and experience to the table. Closely related to the affinity bias is the similarity bias which involves the natural tendency to want to work with people who are like us. Studies have shown that similarity is one of the most significant factors influencing the attraction to candidates during assessment and leads hiring managers to be inclined to “hire in their own image”. Unfortunately, this bias can perpetuate homogenous organizations of employees that look, sound, and act alike. If your organization is truly committed to enhancing diversity, those involved in recruitment and talent management must take deliberate action to change the status quo: Proactively identify organizations, sites, and individuals connected to diverse communities to build awareness of career opportunities. Engage others involved in the hiring process in a frank discussion about the importance of diversity and revisit that priority at each stage of the hiring process to keep it top of mind. Question initial reactions to dismiss the application of a potentially qualified candidate from an underrepresented group. Educate teams on the cultural nuances that may influence candidate behaviours during an interview. Build a culture of inclusivity within your organization by starting a dialogue about diversity and unconscious biases. Challenge your own assumptions and encourage others to do the same. Revaluate hiring strategies and processes. Monitor the success of these strategies. Change in workforce diversity will not happen without change in the way organizations hire and promote. Previously published by the Chronicle Herald. Andrea Forbes-Hurley, Partner with Knightsbridge Robertson Surrette, has been instrumental in the successful completion of over 200 executive search assignments. She has provided strategic counsel to clients in public, private and academic sectors.